Wrap Up Event on March 19: Meet Poe! The Big Read Wrap Up Event is on Saturday, March 19, 2-4 p.m. at Henry Ford Centennial Library. Hope you can attend! This is your chance to meet Poe, hear his story, and ask him questions! Click here to view the flyer and here to view a front-page article from the Dearborn Press & Guide. We also will have the drawing for a FREE night at the Poe House, courtesy of Dearborn Inn. 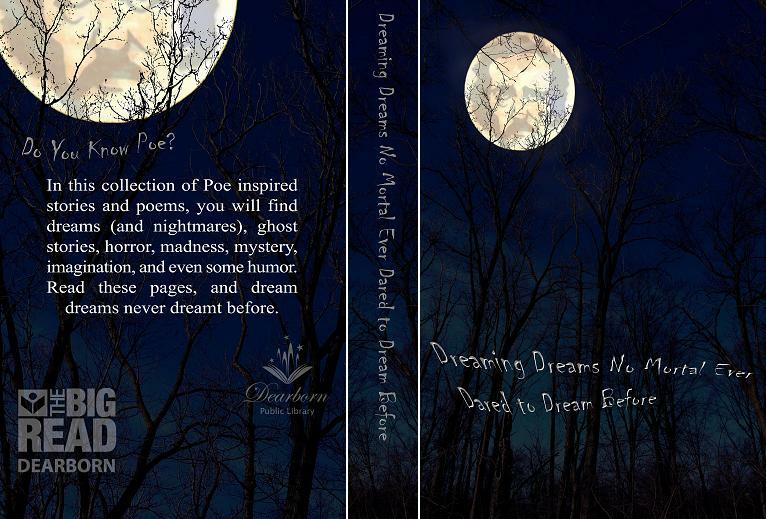 Additionally, you will have a chance to view a draft copy of Dreaming Dreams No Mortal Ever Dared to Dream Before, the anthology of Poe inspired stories and poems with contributions from over 150 authors, many of whom have close ties to Dearborn. Click here to view a draft of the cover.